The following are excerpts of a speech delivered by Mirek Topolánek, former prime minister of the Czech Republic and former president of the European Council, at the Legal Salon in Prague on November 2, 2017. The philosophical roots of the idea of human rights based on equality can be found not only, but especially, in European culture -- from the Code of Hammurabi, through the Cyrus Cylinder, the Magna Carta Libertatum, the USDeclaration of Independence to the Universal Declaration of Human Rights. Yes, our law is based on equality. "increasingly permanent chain of "suspended communities" nesting within nations throughout the West. As these ethnic and cultural enclaves consolidate, they also grow more and more disconnected from the national community... The emergence of these enclaves, reinforced by elite policies of multiculturalism, group identity politics, and the deconstruction of Western heritage, has contributed to the fracturing of Western European nations and has weakened the overall sense of mutual responsibility for one's fellow citizens." ... Muslim women lost many rights they should have had in Europe. They face "honor crimes" for refusing to wear an Islamic veil; for dressing up in Western clothes; for meeting with Christian friends; for converting to another faith; for seeking a divorce; for resisting being beaten and for being too "independent". Let's take a look at Spain, where Muslims are witnessing a shocking population increase. In 1990, Muslims in the country numbered 100,000. By 2010, the number had increased to 1.5 million. In 2017, the number was nearly two million. It is a growth of 1,900% in 27 years. Today there are 1,400 mosques in Spain. According to the Observatory of Religious Pluralism in Spain -- an initiative of the Ministry of Justice – "This figure represents 21% of all places of worship for all religions present in Spain." "The Madrid daily ABC wrote that 800 mosques in Spain are out of control. The Spanish daily La Razon charged that Gulf donors, such as Qatar, were a source of Spain's Islamization. The Saudis also launched a new Spanish television channel, Córdoba TV, as didIran." "They dream of, and work to, regain the 'lost Caliphate' of Spain. Some Islamists do it with bombs and car-ramming attacks. Others, more surreptitiously, do it with money and dawa, Islamic propaganda. The second way may be even more effective than the first." Thousands of Syrian migrants crossing the Balkan route were heading toward Germany. Chancellor Angela Merkel was on the phone with Interior Minister Thomas de Maizière, talking about a number of measures to protect the borders, where thousands of policemen were secretly located along with buses and helicopters. De Maizière turned for advice to Dieter Romann, then head of the police. "Can we live with the images that will come out?" de Mazière asked. "What happens if 500 refugees with children in their arms run toward the border guards?" De Maiziére was told that the appropriate use of the measures to be taken would have be decided by the police on the field. When de Maizière relayed Romann's response to the Chancellor, Merkel reversed her original commitment. And the borders were opened for 180 days. "For historical reasons, the Chancellor feared images of armed German police confronting civilians on our borders," writes Robin Alexander, Die Welt's leading journalist, who revealed these details in a new book, Die Getriebenen ("The Driven Ones"). Alexander reveals the real reason that pushed Merkel to open the door to a million and a half migrants in a few weeks: "In the end, Merkel refused to take responsibility, governing through the polls." This is how the famous Merkel's motto "Wir schaffen das" was born: "We can do it." Merkel's refugee policy was not a masterpiece of humanitarian politics; it was dictated by the fear of television images spread all over the world. In so many key moments, it is the photograph that dictates our behavior: the image that dishonors us, that makes us cringe in horror. Yes, we are in a post-fact or post-truth age. Things are not what they really are, but what they seem to be. What the hell is going on? Where did it come from? Islam is not simply a religion; it is a whole civilization with a detailed political system and legal order – Sharia law. Islamism is a complete ideology that has never been, is not and cannot be compatible with or integrated into our law. Pavel Rychetský [President of the Constitutional Court of the Czech Republic] claims that we cannot violate Muslims' right to religious freedom. That may be true. But I am deeply convinced that we need to start a very profound and, above all, expert legal debate on the issue, and that we must ultimately outlaw political Islam and sharia in our country, just as we did fascism, Nazism and communism. It is a matter of survival to preserve of our form of law and our values. 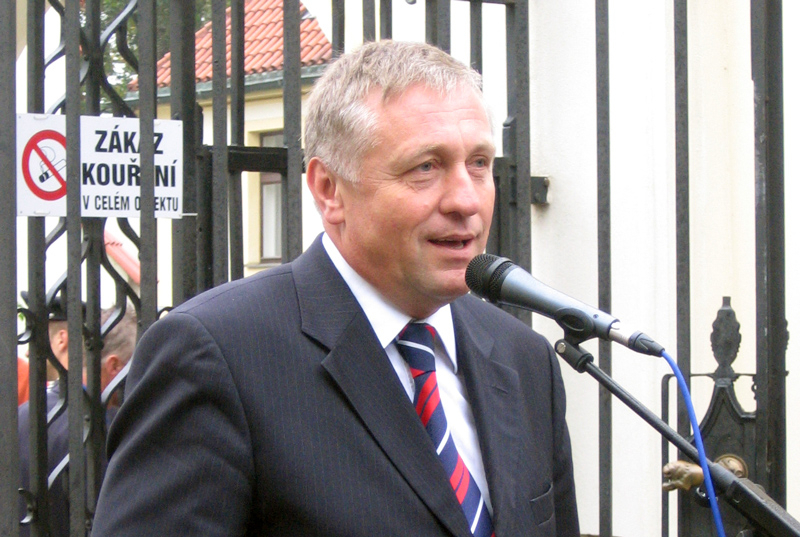 Mirek Topolánek is the former prime minister of the Czech Republic and a candidate for the upcoming presidential elections, to be held January 12-13, 2018. His speech was translated by Josef Zbořil, and is reprinted here with the kind permission of the author.